You are currently browsing mattgee’s articles. We have had a report of a TV Licensing Scam email coming into a University inbox. 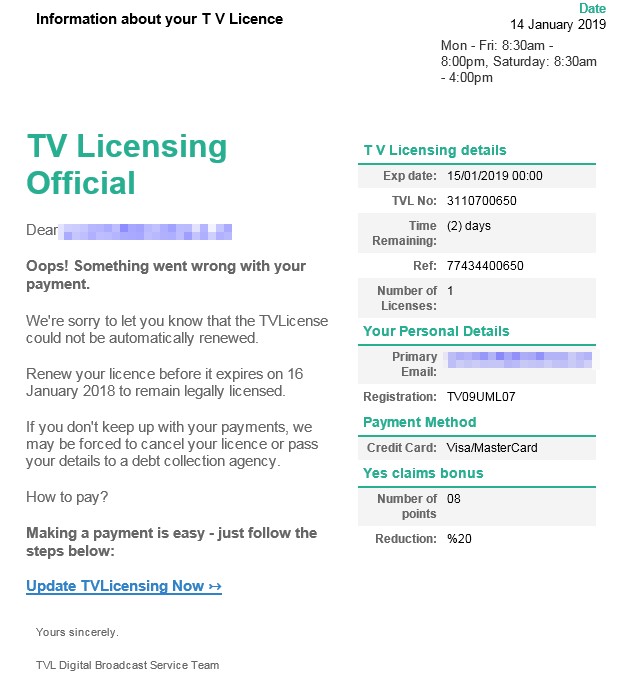 The email claims to be from the “TVL Digital Broadcast Team” and that your TV license could not be automatically renewed. It then directs you to a link that appears to be to update your TV Licensing details. Do not click any links within this email. Doing so could result in the loss of personal data and work and your computer may need to be wiped. For tips on keeping yourself and your information safe online, visit the IT web page on Cyber Security. Email, AppsAnywhere and SMTP are now working. Apart from the above, all services affected over the weekend are now back up. AppsAnywhere site is up, but apps cannot authenticate which makes them inaccessible. SMTP is down, meaning scanning to email is not working, and email cannot be sent from Linux systems such as the MET cluster. We are currently discussing lessons learnt and how to minimise the impact of power outages in the future. Our teams have been working on finding fixes and have restored a majority of services. We are continuing to work on a fix for our IT Self Service Portal (TOPDesk) and will provide an update soon. We will most likely have TOPDesk and Apps Anywhere back up soon but IIQ may take a day to restore service. We will also provide further details on the cause and, depending on the cause, provide plans for avoiding such disruption in the future. We have had a significant amount of disruption over the weekend. This was as a result of some work dealing with a scheduled power outage in the Earley Gate data centre, but it interrupted our services in an unexpected way. We apologise for any disruption this has caused and appreciate that this has been incredibly inconvenient. We are continuing to see some service disruption this Monday morning and will look to remedy this as soon as we can. We will have a further update by 11am, please check back here or our twitter. 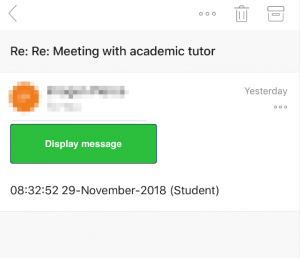 We are still receiving a high amount of reports from students and staff about a new spam email arriving in University Inboxes. If you are a member of staff whose students are reporting this to you we strongly recommend that they change their password via the https://password.reading.ac.uk website. If you go to https://password.reading.ac.uk/reset/ you can reset your password; provided that you know your University Username, Student Number and PIN. These can be obtained by filling out the form at https://password.reading.ac.uk/reminder. An official email from a University of Reading project team was sent yesterday afternoon a little earlier than scheduled. As the email was prematurely released the branding and formatting was incomplete. Thank you for responding and letting us know your concerns about the email, it is good to see Staff aware of seemingly suspicious emails. We have sought clarification from the Windows 10 Upgrade Team, this morning, who have confirmed that this is not a phishing email but a genuine request for further information. The information requested in this email is required by the Windows 10 Upgrade Team and they have asked that you please follow the link to the Microsoft Forms page and provide this. You will receive a further request for information from the team in due course, this will also be sent from Windows10 <vis18w@reading.ac.uk>. As always, if you have any concerns about any emails you receive or that you believe are suspicious, please do contact the Service Desk via it@reading.ac.uk or 6262. Additionally, for tips on keeping yourself and your information safe online, visit the IT web pages on Cyber Security. IT have been receiving reports of a new scam/phishing email coming into University staff inboxes. 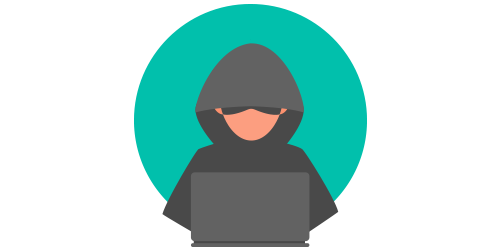 The scam email is designed to make the person who receives it believe that a senior member of staff is contacting them. 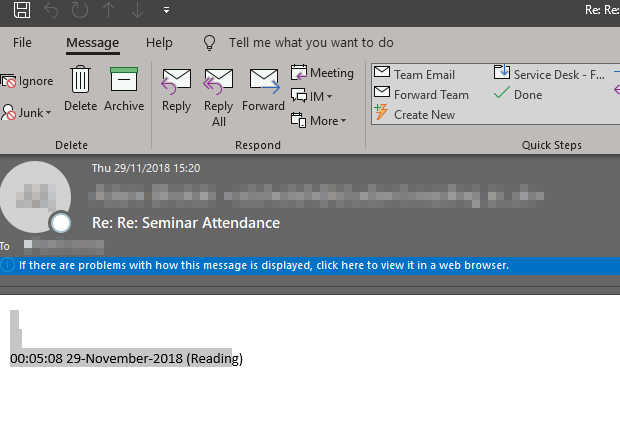 If you reply to the email it will send a new email with harmful links that could damage your work and computer and may make your private details vulnerable. Do not open or reply to this email. This email has affected other institutions including Universities in America and has been reported on the mainstream news.